Reclaim most of the downtown riverfront for a large linear park along the Illinois River. My suggestion is to acquire commercial property currently on the east-side of SW Water Street and turn it into a park for passive (open green space) & active (sport fields & courts) recreation, as well as areas for conservation (especially along the river's edge). This would provide several benefits such as flood control, recreation, public gathering space, areas for public art such as the Sculpture Garden. This would be a long term plan but would have significant impacts on downtown housing and economic development. 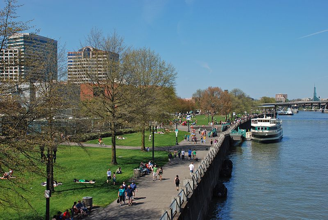 The entire length of the downtown riverfront needs to be made available for a park. Yes- and leave the north side of I-74 of Riverfront Park as it is-- a wonderful refuge from city living along the river. No apartments in Riverfront Park-- preserve the park for future generations. In fact, purchase land further north to extend city parkland beyond Morton Street. And, place a deed restriction on the land to protect it as parkland for th future. Open space with a bike and walking path, parking, restrooms and playground equipment every so often provides the most benefit to the most people. 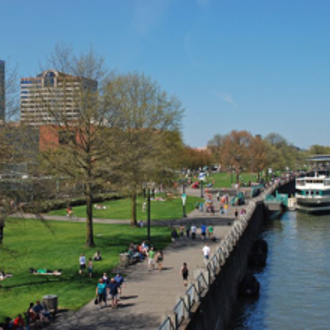 Open space for the various riverfront festivals (especially the fireworks) is important. Open space will also become important to the residents of the buildings downtown currently being redeveloped into apartments and condos. Look at the Chicago lake front or the linear park along the Moline riverfront for examples of the draw a linear park space can provide. The city/park district should make an effort to reclaim property along the riverfront from the Bob Michael bridge to Komatsu for public use as it becomes available. Eventually from Detweiler park to Bartonville. There is room for building development on the opposite side of the closest street to the water instead of on the waterfront.